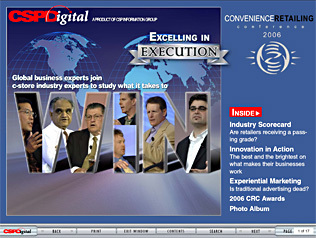 Welcome to CSPDigital's Convenience Retailing 2006 edition, an information-packed online magazine offering you an up-close look at the events, presentations and activities at the 2006 Convenience Retailing Conference, held in Tampa, Fla.
Excelling in Execution : Business consultant and best-selling author Ram Charan leads discussions with industry leaders on what it takes to win. Innovation in Action : A panel of the industry's best and brightest discuss their approach to changing landscape in convenience retailing. Experiential Marketing : Marketing guru Max Lenderman shares his bold views on how to market to the consumers of today and tomorrow. In Acrobat or Adobe Reader, choose Help > Check For Updates Now to install the update. Alternatively, you may download the update directly from the Adobe Website. If this edition of CSPDigital has arrived during a busy period in your workday, use the link below to place a reminder in your calendar to download and read it at a more convenient time (works with Outlook, Eudora and most other PC and Macintosh desktop calendars and Personal Information Managers).